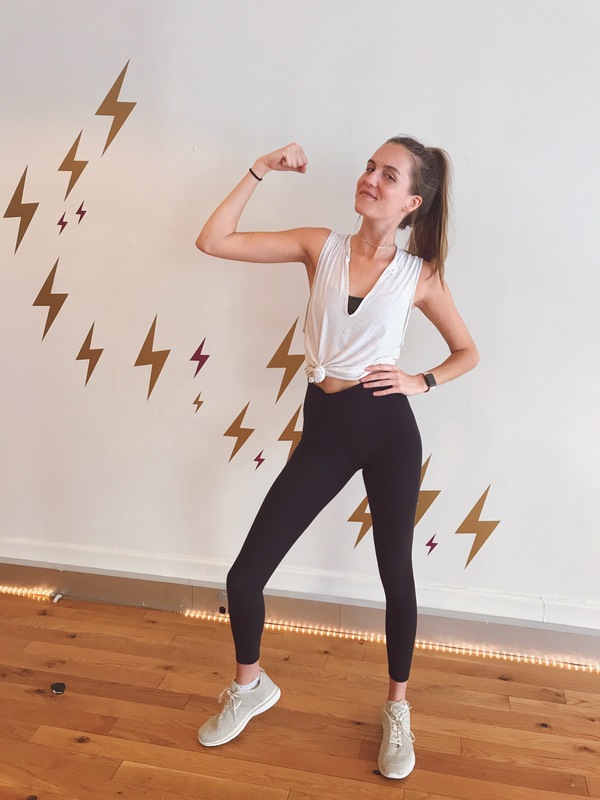 Living in NYC for almost four months now, I’ve tried my fair share of fitness classes. But, it’s important to me to find a balanced weekly fitness that I can maintain alongside my busy grad school schedule. I decided to share my current fitness routine to show how easy it is to stay in good health even while being a student. The same goes for working full time; as long as you create a consistent schedule, it’s easier to stick to it and feel your best. My typical week includes 2-3 classes at various fitness studios, Body by Gilles, occasional weight lifting in my apartment gym, and lots of walking. The workout that I choose for the day really depends on both my school schedule and energy level. If I have class all day and am tired, then I’ll opt for a walk or 30 minutes of Body by Gilles or weights in my gym. If I know that I have an open day, I’ll sign up for a fitness class with a friend or go for a long walk/run. I listen to what my body wants that day and try plan out my fitness classes early in the week on days when I know I’ll have more time. I have a monthly membership with Class Pass, which lets me to take up to 10 classes each month. Class Pass is a fitness membership of either 3, 5, or 10 classes per month at almost any studio in your city. A few months ago, we posted our Class Pass Review, featuring our favorite fitness studios on the app. After trying out one month of the membership, I’m hooked! It’s a no brainer for living in New York because so many studios’ monthly memberships cost double or triple the price. Plus, you get to try so many different workouts instead of being stuck with only one! My favorite types of fitness classes are barre, yoga, pilates and spin. Yoga keeps me centered and helps when I need a good stretch, barre and pilates are great for toning, and spin helps me break a good sweat. Luckily all of these types of classes are available on Class Pass, but of course I’m always down to try a new class not on the app with a friend, too! I want to point out one studio in particular that is my new favorite: Barre3! If you’re a barre regular, you know that so much time in class is spent staring at yourself in the mirror and secretly comparing your body to others in the room. Barre3 is different; instead of focusing on your body’s appearance, you focus on how you feel. You just seem to move to the blaring music, sweat everything out and leave class a little better than you came! Barre3 represents founder Sadie Lincoln’s philosophy of loving your body and working out not for appearance reasons, but instead to achieve “whole body health”. So many times we think of how our body looks, ignoring how we really feel. This is something that I really connect to and really recognized in each class! Not to mention, I was sore for literally four whole days after my first class… There is only one studio in the city, so I definitely recommend booking in advance. If you’re interested in learning more about the studio and its philosophy behind the practice, then I recommend listening to MindBodyGreen’s podcast with Barre3 Founder, Sadie Lincoln. Sadie comes from such an intriguing background that developed her love for wellness. Pure Yoga is not on Class Pass, but I can assure you that this is the best yoga class I have ever taken! They have two locations in the city, one on the Upper West Side and one on the Upper East. The facility itself is enormous compared to most yoga studios and it is pristine. Walking in, you feel like you’re a part of a community. I took the 90 minute long 11:30am class on Saturday with Kiley Holliday and it was such a nice start to my weekend. It was a more advanced class, but I still felt like the instructor guided each move so well and honestly the time flew by. If you follow Natasha Oakley & Devin Brugman on Instagram, then you know that this is their go-to workout routine! This summer, Shir and I started the Body by Gilles 12 week program and it has become a staple for my at home workouts. This is the workout guide that I follow at home when I am not signed up for a class fitness studio. And trust me, this workout can literally be done anywhere! After purchasing the guide, it becomes available to download on your phone or laptop, which makes it so easy to bring with you to travel. Each week in the guide features three different workouts that seriously make you break a sweat. It is perfect for people of all skill levels and breaks down exactly how to do each move. My favorite part about the guide is Gilles’ philosophy of working for your inner happiness. Fitness is supposed to be fun and I’ve found that this workout regime is something that can easily be added into anyone’s weekly routine. If I find myself with only 30 minutes to workout, I’ll go downstairs to my gym and do a little bit of weights. After all, I’m no pro, but I figure that even just a half hour of weight training a few times throughout the week can help improve my strength. I suggest reading Thinner Leaner Stronger by Michael Matthews if you’re new to lifting weights, it can really change your perspective! I try to hit about 10,000 steps each day (or more!) and really cherish my time spent walking outdoors. It helps to clear my mind and get rid of some stress on a busy day. With a good playlist or podcast, I could walk the whole city and it helps to learn to navigate your city, too! If possible, I suggest giving yourself an extra 30 minutes or so to walk to work, school, or an appointment. Experts say that even 20-30 minutes of moderate exercise a day can help improve your stress levels and live a longer, healthier life!